Tena koutou! Next week is Te Wiki o Te Reo Māori – Māori Language Week – and UC will celebrate with a wide range of events and activities on campus. The theme this year is Whāngaihia te reo Māori ki ngā Mātua – supporting parents to pass te reo on to their tamariki/children. If you’re keen to get involved, you can pick up a free UC te reo resource pack from the Māori Development Team reception in the Te Ao Mārama building, the Puaka-James Hight Library or the Henry Field Library at Dovedale. You can also access a wide range of resources on Learn. The week will be launched at 9.30am on 27 Hōngongoi/July in the Puaka-James Hight Library where Te Akatoki Kapa Haka will perform waiata tautoko. You can find out what else is happening on campus here. 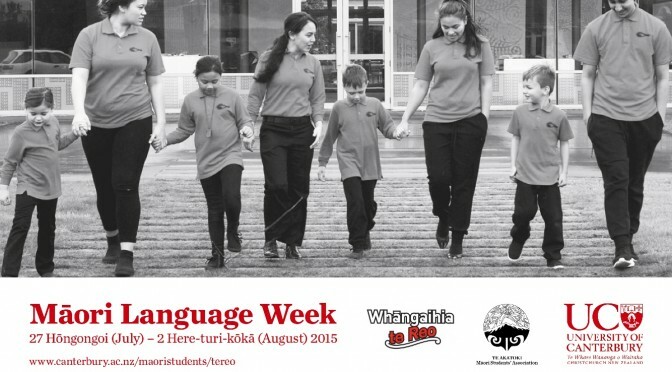 You can also follow the national week of celebrations on Te Wiki o Te Reo Māori on Facebook.